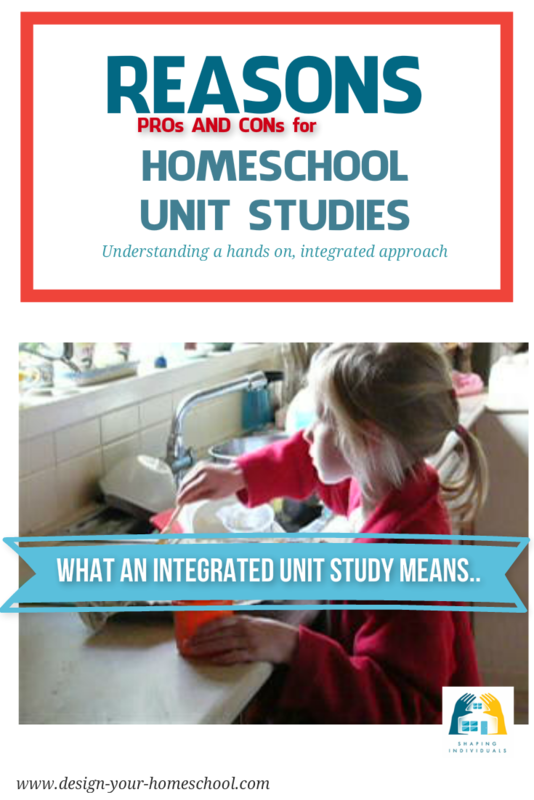 There are some wonderful ideas for homeschooling unit studies. Unit Studies approach a theme or a topic from several angles, encouraging a love of learning through interesting activities across a variety of subject areas. 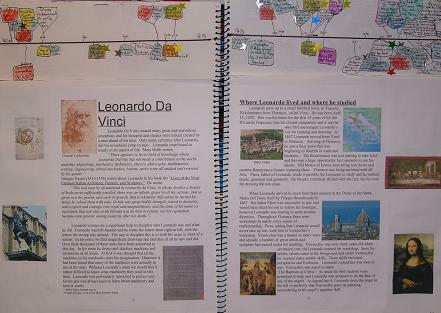 Unit studies are structured around a topic or theme and then developed and applied in the areas of the Arts, History, Science, Health, Physical Education, Language Arts and Biblical studies. So, how do you choose and find the best unit study idea? The first thing you need to do is to choose the broad homeschooling subject area which you may use as a basis for a unit study topic. This could be an interest based topic within History, Science, Bible, Literature, a Character Building theme or something based on your child's individual interest and totally delight directed. You can choose it in a number of ways. When my children were young, I knew there were character issues we needed to work on, so I loved using KONOS, a hands-on character curriculum. We explored a character trait across the subject areas - Science, Literature, History, Bible. I remember one unit study we did on Patience since we were waiting for the birth of another baby. It was a good lesson for me! We also studied Attentiveness and at that time had so much fun learning about the ear, making a huge ear out of all sorts of things about the house and actually crawling all the way through it. We learned about characters who listened through books and those who chose not to listen. Sometimes Unit Studies choose you! While playing out in the bush one day, one inquisitive child found a caterpillar on a plant. 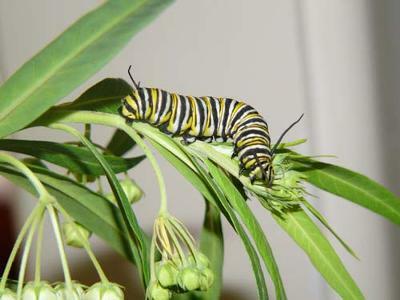 This was the beginning of a delight directed unit study on Monarch butterflies, the butterfly lifecycle, transformations and so on. Sometimes a unit study is decided within a library. I know we have stumbled upon interesting books and then find out we're walking out of the library with things to read, make and do together. It doesn't have to be official, and it doesn't have to be pre-planned. 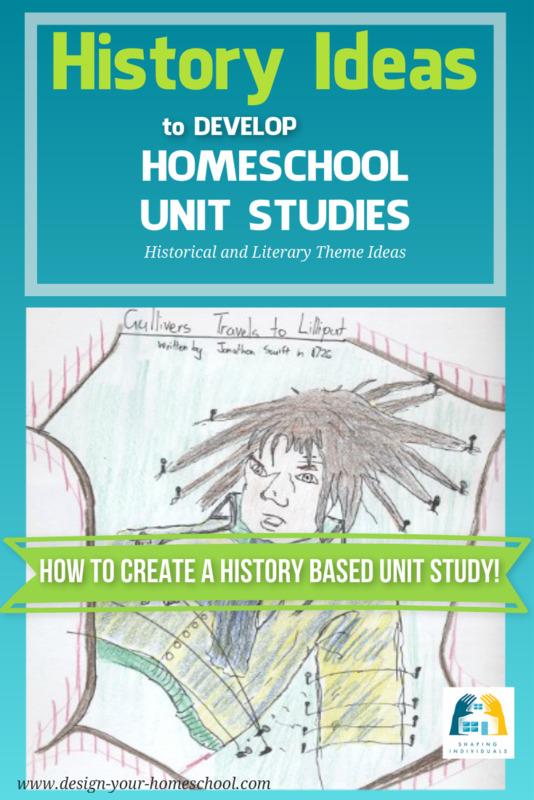 You might only to decide to write about your 'unit study' after you have finished it and then written a learning log for your homeschool records after you have completed the study. 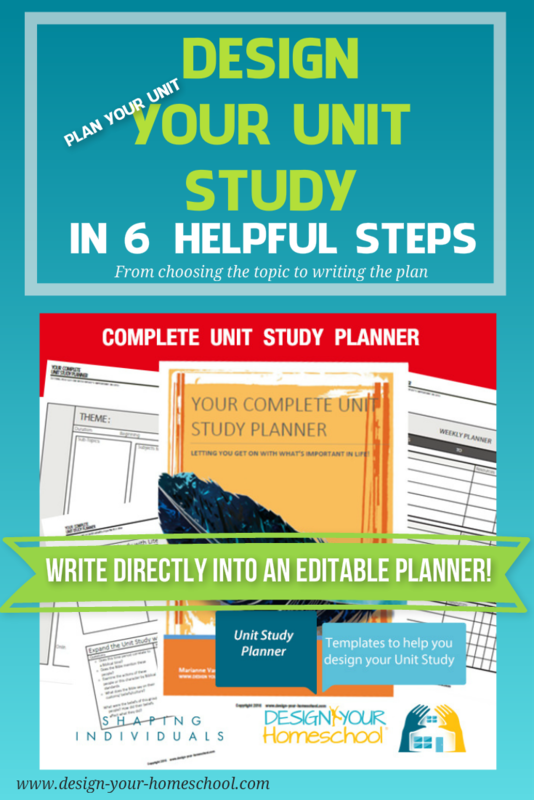 Whichever way you choose, it is helpful to write out your ideas on unit study planning sheets. We have enjoyed using KWL - planning pages which help us to write down what we already KNOW, what we WANT to know, and later, what we have LEARNED. I love brainstorming ideas with my kids and so I often use a standard type of brainstorming page which enables us to think about the homeschool topic idea and branch off into a ton of sub-topics we may follow. 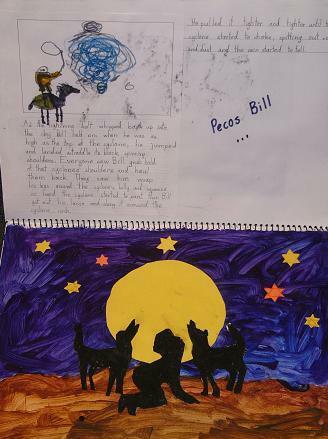 Ideas come from discussing things together, and bit by bit, we add art projects, history ideas, science experiments, great literature to read... and so on. 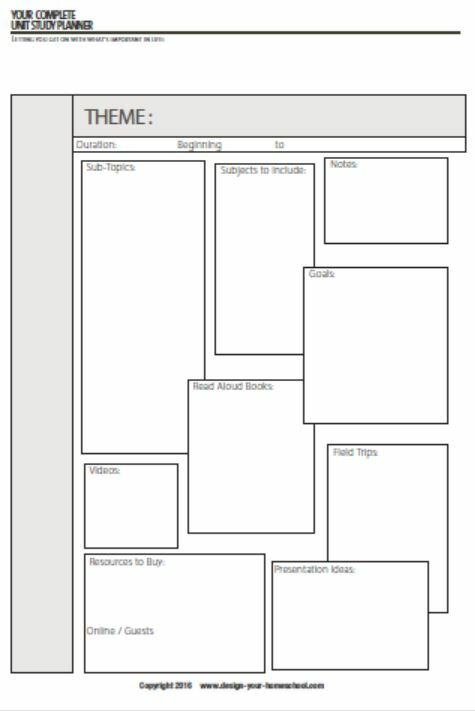 This is where a Unit Study Planner can come in handy - templates which help you think through your topic and places to write it down. 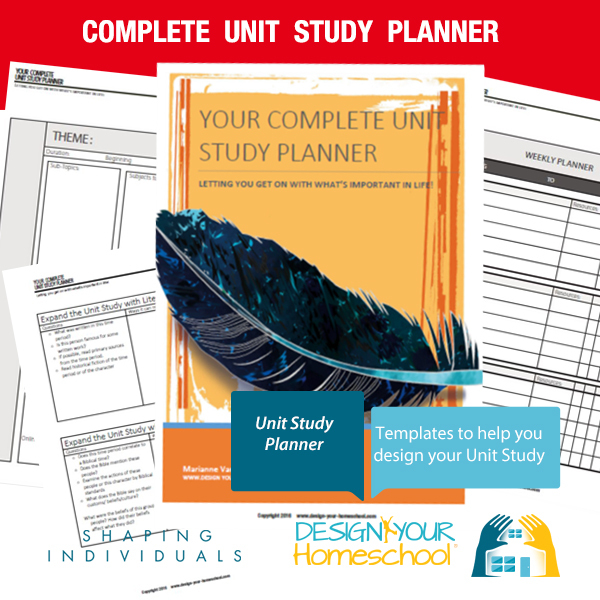 My Complete Homeschool Unit Study Planner has editable forms to help you design your own unit study again and again. The choice is virtually limitless. Below you will find ideas which you can develop into a variety of homeschooling unit studies. Here you can study the characters which have shaped the world we live in today. - Studying Birds? Here's a Free Printable Bird Set for your homeschooling unit studies. An excellent resource for free literature study guides for numerous titles is Glencoe Literature Study Guides. Also, I'm sure you'd love teaching literature with the amazing LitWits Kits. If you love the idea of teaching homeschooling unit studies around character themes, you will love KONOS Curriculum. What the Bible says about sexual relationships. You may choose one or more of each theme per year. If you plan in advance, you can sketch out a broad overview and cover important topics that way. If you plan a general outline for a few years in advance, you can make sure you cover the time periods and also study Science Units from each Division. This is a selection of Unit Study Topic Ideas. Yet, the list is as endless as your own imagination or that of your children. 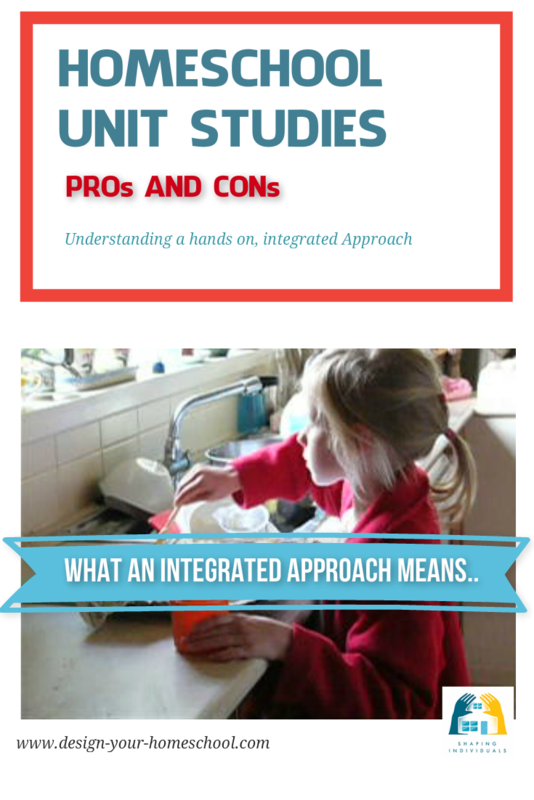 Enjoy the journey of exploring a unit study topic together! The next thing you can do is to brainstorm the unit study idea with questions. This page helps you to do that by asking questions about the topic or the unit study idea and opening up the unit study in many different ways. 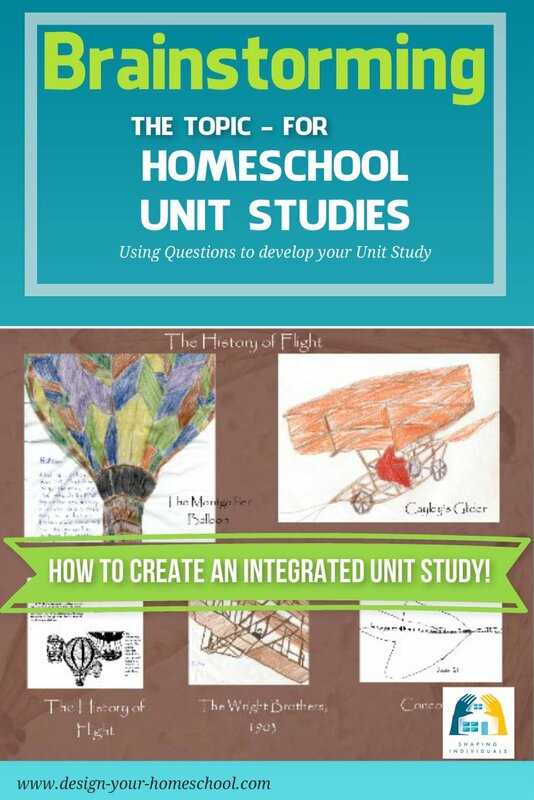 These pages are written to help you design your own homeschooling unit study by brainstorming, teaching the subjects outside the study, adding kid's learning activities and using these Homeschool Unit Study Planner templates to flesh out the topic.